At Gero Onsen Gassho-mura, 10 gassho-zukuri (thatched) houses have been transferred from places like Shirakawa-go to form a precious outdoor museum which recreates a mountain settlement from former times, and offers a glimpse into what life might have been like for its inhabitants. We are looking forward to see you all! 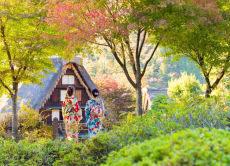 The kimono and tea ceremony experience. The traditional village was wonderfully secluded from the outside making it not overcrowded with tourists. The kimono instructor was very kind and offered many suggestions. So the experience of wearing the kimono in the scenic village was an one of a kind experience. Besides the village there are many other spots to visit within the vicinity. Gero is a destination worth making the trip to. We felt that the dressing up was quite rushed and there was no care when we had our hair done. Perhaps hair wasn't included in the 'costume' but it was literally just a hair pin accessory. The tea ceremony probably took about 5 minutes, then we were given a few delicious sweet cakes before the lady disappeared altogether. We waited about 10 mins and when we didn't return, we headed out to explore. Gero Onsen town is a beautiful place to walk through and take photos. Being dressed in kimonos made the experience so much better, and we even got to try some traditional foods.